The R-PLEX Human Tie-2 Antibody Set includes a matched capture and detection antibody pair and calibrator for the quick and easy measurement of Tie-2 in biological samples. R-PLEX products leverage MSD’s electrochemiluminescence technology for better sensitivity and a larger dynamic range than traditional ELISAs. R-PLEX matched antibody sets enable the development of singleplex and multiplex immunoassays. Individual assays may be developed using MSD avidin- or streptavidin-coated plates. Custom multiplex assays with any combination of R-PLEX analytes, as well as R-PLEX plus U-PLEX analytes can be developed on U-PLEX MULTI-SPOT plates. To learn more about the advantages of R-PLEX products click here. 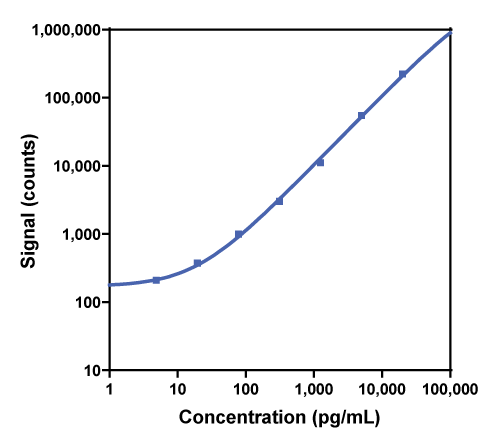 Calibration curve for the R-PLEX Human Tie-2 Antibody Set was assessed and representative data is presented below. Description - Tyrosine kinase-2 (Tie-2, TEK, VMCM, GLC3E, TIE-2, CD202B) is a receptor-like tyrosine kinase expressed almost exclusively in the endothelium of actively growing blood vessels. Tie-2 is a receptor for the Angiopoietin family of ligands - especially Ang-1 and Ang-2, and is produced by early hematopoietic cells. The soluble form of Tie-2 (sTIE-2) which in some conditions is the entire transmembrane receptor, is found in the plasma and serum of healthy human individuals, but also correlates with come cancers including renal carcinoma.The assay was developed to recognize the extracellular portion of Tie-2 , which is the most common shedded version of the molecule. Full length is seen in the plasma as a part of exosomes. Electrochemiluminescence to detect surface proteins on live cells. A high throughput electrochemiluminescent cell-binding assay for therapeutic anti-CD20 antibody selection.